This pooch really went the distance to make sure his owner was going to be OK. After experiencing some dizziness, J.R. Nicholson, an 85-year-old rancher from Mason, Texas, was rushed to the hospital late last month, ABC News reported. Little did he know, his faithful furry friend, Buddy, wasn’t planning on leaving his side. 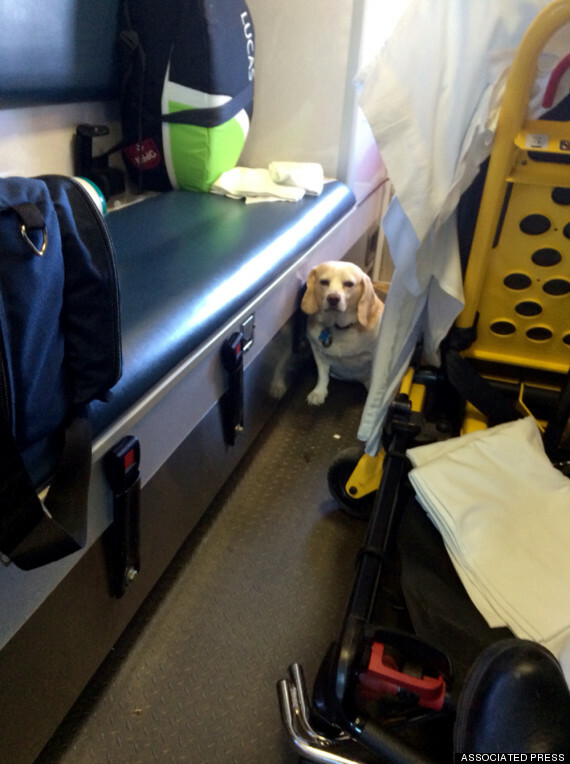 A motorist spotted the dog on the side step of the ambulance as it was en route to the hospital, and flagged down the driver. The pup, who was immediately brought into the vehicle after the sighting, had been clinging on for 15 – 21 miles and was thankfully unharmed, according to the outlet. A feisty little pooch took on a 400-ton Metro-North train on Tuesday — bravely running with it from the South Bronx to Manhattan. “She was just running like she didn’t have a care in the world,” said engineer Joseph Delia, 52, who was at the controls of the 10:39 a.m. Hudson Line train to Grand Central. The speedy pup began the epic chase at the busy Mott Haven Junction, racing alongside the train as it made its way out of The Bronx. A 7-year-old Tennessee boy, lost and shivering in the cold, cuddled with his dog to stay warm before rescuers reached them. Dominic Jeffries was out with his pooch Coco when they became caught in a space between bushes and a wall near their home last week in Cordova, Tenn. Temperatures dipped below freezing but Dominic held on right with Coco, his family’s black Shih Tzu, officials told ABC News.